Our first campaign was born out of need. In November last year, five hospitals were bombed in Aleppo. One of them was a children’s hospital. Like many of you, we felt that humanity was failing the Syrian people, and yet we felt powerless to help. Through crowdfunding, a group of us attempted to connect people from around the world that wanted to help, with the Syrians that so desperately needed it. Within just a few days, the campaign had gone viral – and the public had donated enough to provide the medical equipment the children’s hospital would need to rebuild. In a large truck laden with this medical equipment, our ‘People’s Convoy’ set off from the UK. It battled through harsh winter conditions to reach the Syrian border, where we handed the equipment over to a medical humanitarian organisation working on the ground in Syria. This combined effort led to the building of a new hospital, ‘Hope Hospital’, which will provide care for 55,000 Syrian children. Six weeks, 5,000 donors and £247,000 later, something became obvious: if we could provide the public with a direct way to support the local humanitarian response to war, good things can get done. What’s more, they can get done very quickly. This quick response has saved more lives and meant less suffering in Syria. And it proved to us here at CanDo that our new vision for getting support directly to local humanitarians works. Hope Hospital is the only paediatric hospital in Eastern rural Aleppo and serves approximately 170,000 people, 30,000 of which are people that have been displaced. Although Hope Hospital started to provide its services on the 8th April 2017, the total number of outpatient consultations reached to 1,031 people and 30 in-patients in just the first three weeks. By the end of June, just less than three months after opening, the total number of discharged inpatients was 292. The outpatient consultations for the same period reached to 7,381 people including 960 under the age of 1 year old and 3,757 between 1-5 years old. 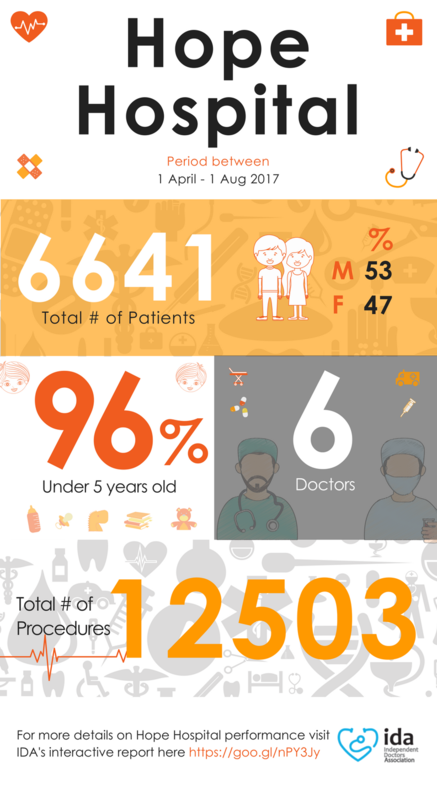 These numbers reflect the impact, success, and effectiveness of Hope Hospital in saving, changing and dignifying lives of Syrian children. In addition, the hospital team have adapted health services for adults in the area too because of the lack of existing health provisions elsewhere. Since Hope Hospital opened its doors in April of this year it has had a fantastic feedback from patients. But we'll let the numbers (and patients) speak for themselves. Here is what some of our partner and supporters have said about us. We would like to express our most heartfelt gratitude for all that you have accomplished in the past months. Thank you so much for reaching out to us during one of our most difficult times, when Aleppo was under intense struggle and when our hopes and morale were at an all-time low! Thank you for being there with your support - both emotionally and materially - consistency and reliability.